The Pisces and Aquarius compatibility in a romantic relationship will have a lot of compassion and creativity. They will both be idealistic when they are on their own or together. Pisces will flow with the dream like state that surrounds them. Aquarius will continually think up new ideas and ways of doing things. Their relationship will dig deep for the truth of the situation. The Pisces Aquarius soul mates will both be looking for a way to solve any trouble they might see. They will typically both be introspective. Aquarius can be quick to judge other people who do not have the same vision that they do. Pisces can be too compassionate. They could give it to other people who do not deserve it. The planets Jupiter and Neptune will rule over Pisces sun sign and the planets Uranus and Saturn will rule over Aquarius. Jupiter is about luck, Neptune is about illusions, Uranus is about rebellion, and Saturn is about karma. Uranus will concentrate on skeptical ideas and innovative practices. Saturn will give the relationship the motivation to act on the ideas. They will make them able to organize the details that will put the ideas into practice. Jupiter is concerned with philosophy, teaching, and understanding. Neptune will concentrate on the spiritual angle. Pisces will enjoy being able to genuinely understand new and exciting things like their partner. Aquarius will think of new ideas a lot. Pisces will be eager to understand their new ideas on an intuitive level. The Pisces Aquarius will have a relationship that is complementary. It will have a lot of intelligent and emotional resources. The best thing about Pisces Aquarius love compatibility in a romantic relationship is that they are both interested in cultivating knowledge. They will both be willing to accept modern and sophisticated ideas. They will have comparable levels of excitement and energy. Pisces dating Aquarius will both want a genuine, open, and honest relationship. They will have interests in common and personalities that will work well together. Because of this, they will be very compatible. Pisces and Aquarius compatibility will be an interesting mix of “what could be”. Pisces is the dreamer of the zodiac and Aquarius is the visionary of the zodiac. Neither zodiac sign is happy with the world. They both want to find a way to improve it. They can have a captivating horoscope compatibility that can do a lot of good. The Aquarius personality is cool, distant, and detached. They will work on a very different level of emotions than the fish. The Pisces born is sensitive and has a lot of emotions. However, they are both kind and have a lot of compassion which will make them different from other zodiac signs. Pisces and Aquarius marriage will be more compatible when they can find a happy middle ground in their range of emotions. The planet Neptune is mystical and will rule over Pisces. The planet Uranus is unpredictable and will rule over Aquarius. They can have a special kind of mysterious magic together. The fish can help the water bearer use more intuition. The Aquarius man or Aquarius woman will be able to give Pisces airy wings to pull them out of their emotions before they become too much. They will have a karmic connection. They both have a sense of purpose when they are caring for other people. Pisces and Aquarius relationship will be compatible because they are able to care a lot about each other. Pisces is a Mutable sign. They will be more than happy to accept the ideas and changes as long as they have a role to improve the relationship. Aquarius is a Fixed sign. They will think of new ideas and start changes. When they are together, they will not be likely to argue over who will take credit for their accomplishments. Aquarius is an air sign and they will need to be careful to not make any trouble with Pisces. The fish will need to be careful to not be too needy or possessive. The water bearer will not like feeling their lover wants more commitment than they are ready to give. They can both understand each other and the longer they are together the more likely they are to be in love. The Pisces Aquarius love compatibility is healthy for both of them. They will both be able to understand what each other needs. Aquarius will make Pisces’ emotions more rational, but will be careful not to hurt their feelings. The fish will help the water bearer to use their emotions instead of just thinking. They will work well together as a team. Pisces Aquarius compatibility might find it hard to deal with the details of everyday life. Neither star sign is very rational. At the same time, they will make a home together that will have a lot of love, inspiration, and kindness. They will be more compatible because they will be able to agree on the important parts of their relationship. They will not be likely to argue over things like parenting, family money, or priorities in a Pisces Aquarius marriage. But the reason for discontent will be something else. If they do have a disagreement they are able to discuss it. However, the Pisces man or Pisces woman might become tired of talking about it and want to escape into their fantasy world. The Aquarian might be able to bring the fish back into the discussion and they will find a solution to their disagreement. The fish will need persistence and the water bearer can give it to them but this will take quite some effort. In a Pisces Aquarius relationship, both will be better at starting new projects rather than completing them. The Aquarius man or Aquarius woman might become bored with the relationship. Pisces might then become bored and will want to move on. Pisces is a Water sign. Aquarius is an Air sign. Their relationship will be motivated by feeling from the fish and thought from the water bearer. They will always have a lot of things happening in their relationship. The Pisces Aquarius in love will be very flexible and progressive. When the relationship is good, it will be very good. At the same time, when the relationship is bad, Pisces and Aquarius soul mates will have no communication. Pisces will want to be where Aquarius gets their action and intellect from. They are timid but they can teach the water bearer to be more tolerant in a social way and to be more warm. The fish and water bearer could definitely disagree but their differences of opinion will not last long. They might argue because the Piscean will need emotional encouragement and affection. Aquarius will prefer ideas other than romance. When the ideas don’t match then a Pisces Aquarius breakup is bound to be on the cards. The Pisces and Aquarius friendship can be very good. They will definitely be great in a romantic relationship. They will likely not have a lot of arguments. The Aquarian might be too intelligent and distant for the fish. The Pisces personality might too easily sacrifice and be gullible for the water bearer. They could have different reactions to a situation which might make them feel far apart. The Aquarius star sign will be likely to quickly dismiss the people who do not agree with them. At the same time, the fish will be likely to take on other people’s trouble too quickly. They could not have a lot of disagreements with each other, but when they do they will forgive and forget easily. Pisces men and Pisces women are gentle and loving and will give the relationship most of their romance. Aquarius will have to learn to be somewhat romantic. They are very emotionally distant. However, they enjoy the emotions of the fish. 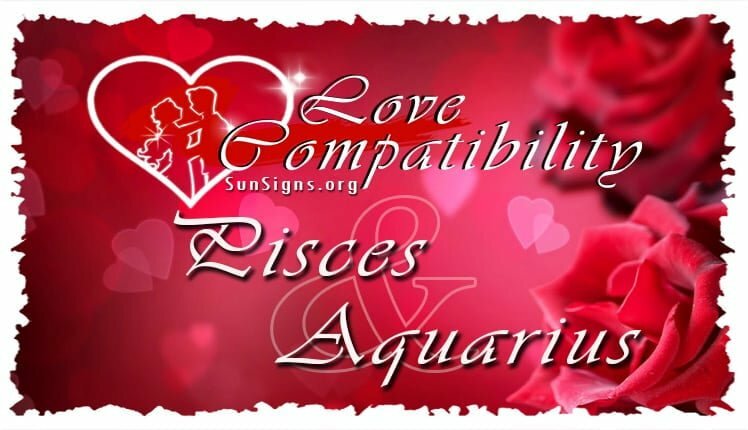 The Pisces Aquarius love compatibility works out because they will both understand each other. They are one of the most compatible water and air relationships in the zodiac.